I love it when my favorite preschool supplies can be repurposed for multiple projects! This foam number puzzle is a staple at our house. It is wonderful when used for it’s intended purpose (as a puzzle), but it also provides many other learn through play opportunities as well! 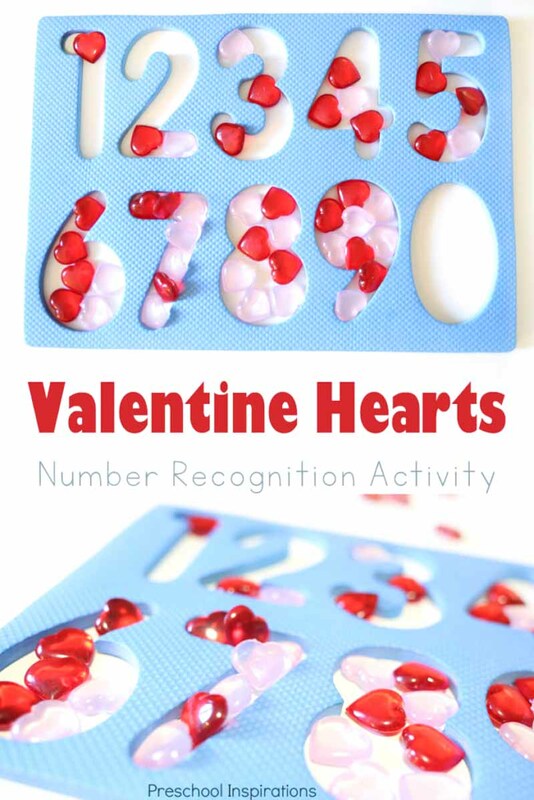 Take, for example, this Valentine hearts number recognition activity. 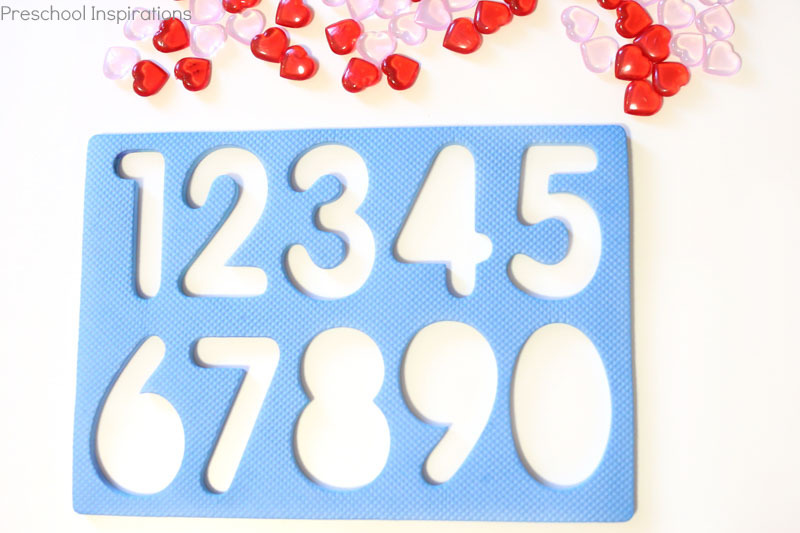 This activity provides preschoolers with a great opportunity to develop fine motor skills, practice counting, and work on number recognition in general. To set-up this project, I simply placed the acrylic hearts on the table along with the number puzzle (with the numbers removed so all that was left was the frame). 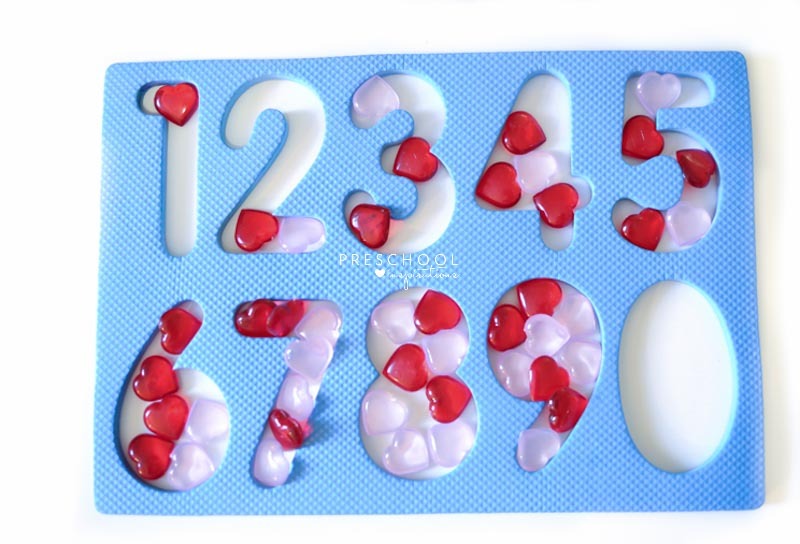 My preschoolers and I worked together on counting and filling each number frame with the corresponding number of acrylic hearts. Pinching and placing each heart in the frame was great fine motor work for their little fingers! The hearts will overlap in a few of the numbers, but that’s okay. Just ask kids to fit them in as best as possible. 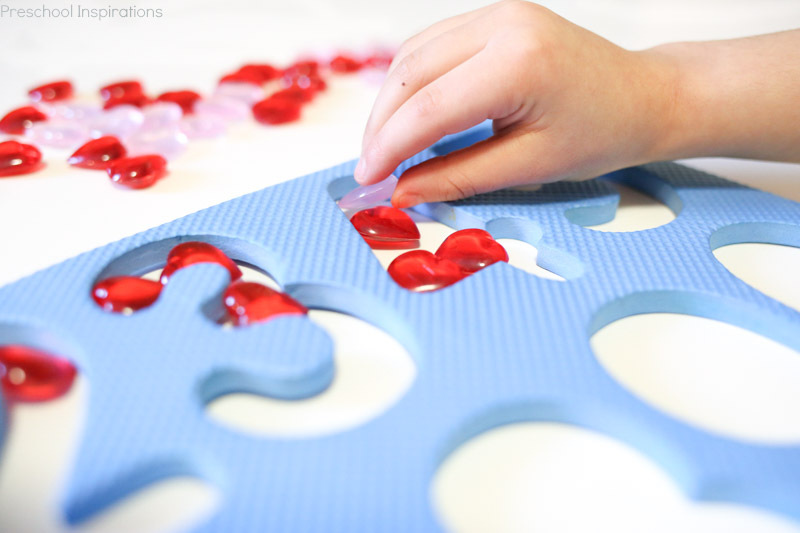 You can extend the activity by asking your kids to make patterns with the hearts as well. 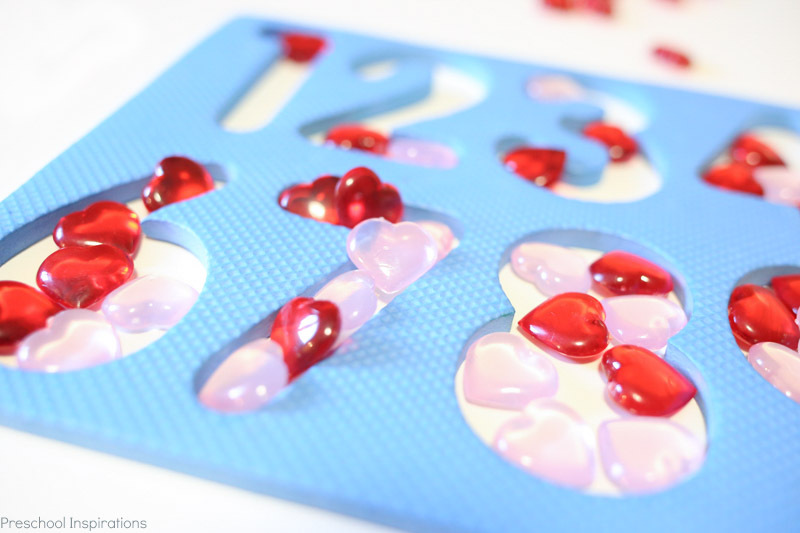 Alternatively, you could choose to use conversation hearts instead of acrylic hearts. This way kids can have a learning project and treat afterward (you may want to limit the number of candies they receive, though) ;-). 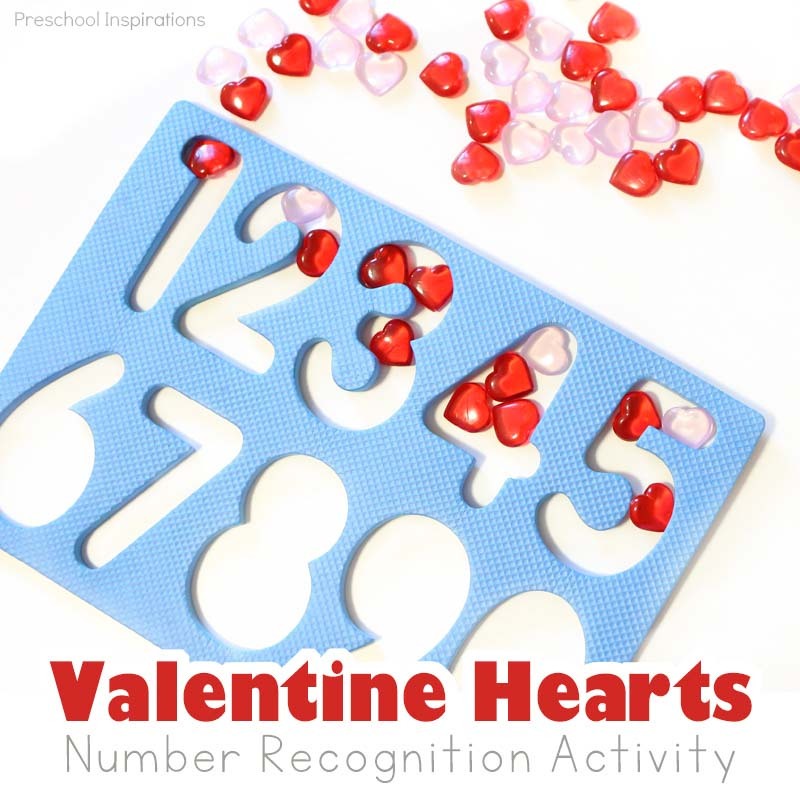 Are you going to try this easy Valentine’s Day number recognition activity with the kids? If you’re looking for more Valentine’s Day activities, check out these projects that use conversation hearts! Clarissa is a former elementary teacher turned homeschool mom and blogger at Munchkins and Moms. She loves to share creative preschool activities that are both playful and educational. Don’t forget to follow her on Pinterest, Facebook, and Instagram for more inspiration!